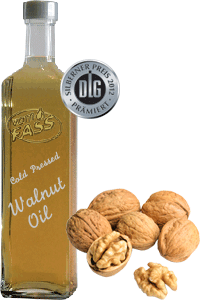 This superb oil is made from roasted walnuts. It has an intense nut flavor that perfectly underscores endive salad or any other salad. This oil should not be heated otherwise beneficial polyunsaturated fatty acids will be destroyed. This oil can also be used as a natural skin care!